1. Warm up: Play "The Price Is Right" with the students. b. Have all the students in the front stand up. c. Produce an item from a bag, and ask the students "How much is this?" d. Have each standing student answer in English. If they can't say the number, have them say it in Japanese, tell them it in English, and make them repeat the English. f. Announce the correct answer, and award a point to the team with the closest guess. g. Repeat with the students one desk back, and so on until all students have guessed once. 3. 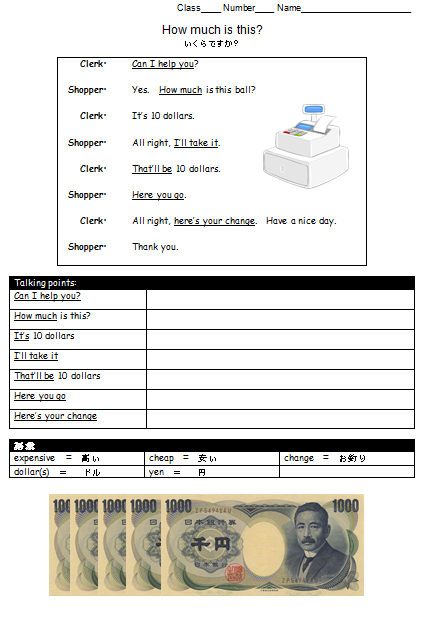 Check for comprehension in your preferred manner, and have students write out the meanings in Japanese of the "talking points." 4. Read and repeat dialog with students. 5. 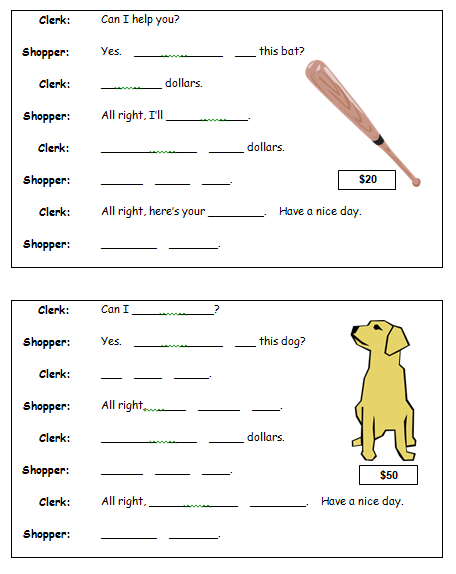 Have students practice dialog in pairs. 6. If the students seem like they are up to the challenge, have them demonstrate the dialog in front of the class with an item from "the price is right" earlier. If not, have them do the writing practice on the back of the worksheet. Instead of writing practice, you could try a shopping activity .